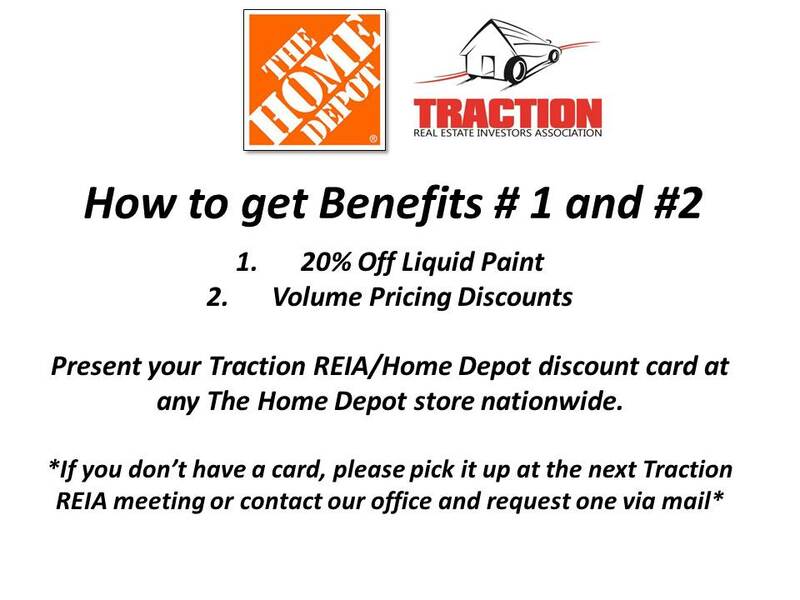 Traction REIA and The Home Depot are happy to announce the great benefits available exclusively for Traction REIA members. 1. 20% off of all liquid paint products. This adds a terrific discount to already great prices on paint. This is a “point-of-sale” discount available at any register nationwide. Simply enter this phone number at the register to apply the discount: 202-558-6508. 2. Lower threshold to use the “Bid Room” Pro-Desk Discount Pricing. Traction REIA members enjoy a reduced threshold of only $1,000. paint discount at any register. 4. 2% Cash-Back Rebate on all your Home Depot purchases. qualifying pre-tax purchases made at The Home Depot. You will receive a rebate check twice a year. Individual enrollment is needed for this program. View the Home Depot Rebate Program sign-up instructions here. Accounts must be registered/enrolled through the link above to receive rebate credit. Payments below $100 will be paid with Home Depot Gift Cards.